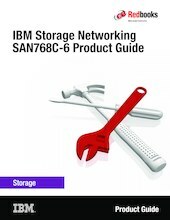 This IBM® Redbooks® Product Guide describes the IBM Storage Networking SAN768C-6. IBM Storage Networking SAN768C-6 has the industry’s highest port density for a storage area network (SAN) director and features 768 line-rate 32 gigabits per second (Gbps) or 16 Gbps Fibre Channel ports. Designed to support multiprotocol workloads, IBM Storage Networking SAN768C-6 enables SAN consolidation and collapsed-core solutions for large enterprises, which reduces the number of managed switches and leads to easy-to-manage deployments. IBM Storage Networking SAN768C-6 supports the 48-Port 32 Gbps Fibre Channel Switching Module, the 48-Port 16 Gbps Fibre Channel Switching Module, the 48-port 10 Gbps FCoE Switching Module, the 24-port 40 Gbps FCoE switching module, and the 24/10-port SAN Extension Module. By reducing the number of front-panel ports that are used on inter-switch links (ISLs), it also offers room for future growth. IBM Storage Networking SAN768C-6 addresses the mounting storage requirements of today’s large virtualized data centers. As a director-class SAN switch, IBM Storage Networking SAN768C-6 uses the same operating system and management interface as other IBM data center switches. It brings intelligent capabilities to a high-performance, protocol-independent switch fabric, and delivers uncompromising availability, security, scalability, simplified management, and the flexibility to integrate new technologies. You can use IBM Storage Networking SAN768C-6 to transparently deploy unified fabrics with Fibre Channel and Fibre Channel over Ethernet (FCoE) connectivity to achieve low total cost of ownership (TCO). For mission-critical enterprise storage networks that require secure, robust, cost-effective business-continuance services, the FCIP extension module is designed to deliver outstanding SAN extension performance, reducing latency for disk and tape operations with FCIP acceleration features, including FCIP write acceleration and FCIP tape write and read acceleration.